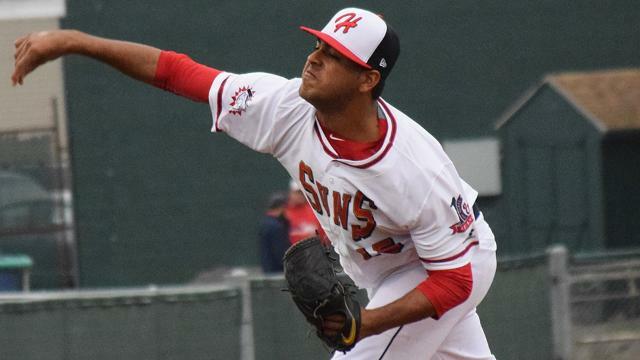 HAGERSTOWN, MD (April 12, 2019)- Pedro Avila became the second former Sun to make his Major League debut in 2019 Thursday for the San Diego Padres in Arizona. The 22-year-old offered 85 pitchers in the start, worked five innings, earning a no decision and allowed just four hits and one run in the Padres 7-6 win. Avila was traded from the Nationals to the Padres December 2, 2016 in exchange for catcher Derek Norris . The righty played for the Suns in 2016, starting all 20 games he appeared in and finishing with a 7-7 record. The Venezuela-native fanned 92 batters in 93 innings to pair with a 3.48 ERA. He made a name for himself during the month of June in Hagerstown. In six starts that month, he worked 30.2 innings, fanned 26 batters and held opponents to a .227 average. He finished the month with a 2.35 ERA. The pitcher was signed as an International Free Agent out of Venezuela July 15, 2014. Avila earned a 2018 CAL Mid-Season All-Star bid last season. Avila became the 221st former Sun to play in Major League Baseball. For more information about former Suns players, visit hagerstownsuns.com.